Hotel Giorgetti Palace is a 3 star hotel in Bellaria, located directly on the sea front. It features rooms with panoramic balconies, air conditioning and free WI-FI throughout the entire hotel. Furthermore, it accepts small and medium-sized animals. 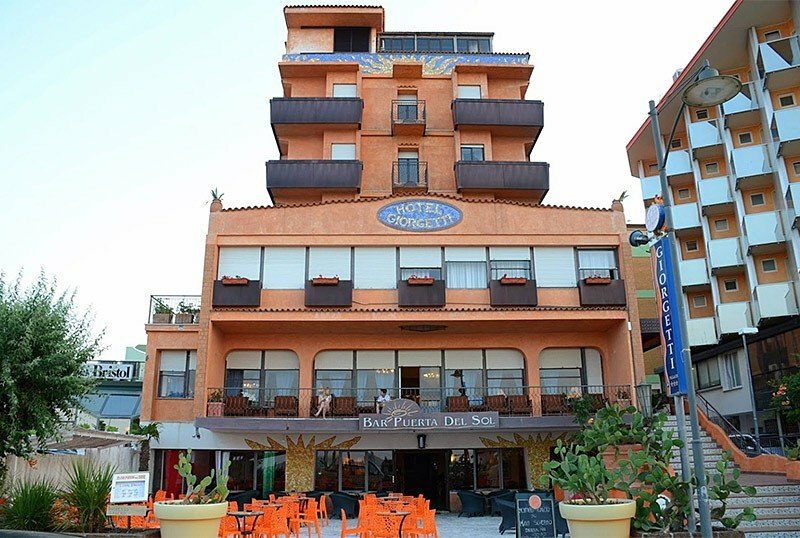 The hotel is located directly on the beach, on the seafront of Bellaria, 5 minutes walk from the center and the pedestrian area, full of shops, pubs and clubs. Its location is convenient for those who want to move on foot or by bike to the city or easily reach the train station. All rooms have a balcony (sea view on request), air conditioning, free WI-FI, safe, direct dial telephone, satellite TV and digital terrestrial, safe and private bathroom with hairdryer and shower. FAMILIES : family solutions are available, as well as triple and connecting rooms. Garden, terrace, bar, living room with terrace facing the sea, with TV corner and reading room. Theme nights are organized. PARKING : uncovered and covered, available on request. AIR CONDITIONING : available at no additional cost. PETS : accepts small and medium-sized animals. BREAKFAST : international buffet breakfast with homemade desserts and hot coffee drinks. LUNCH AND DINNER : the kitchen offers traditional recipes of Romagna in 3 menus to choose between meat and fish every day, followed by a buffet of vegetables and appetizers of all kinds. Pasta and desserts are homemade. In hotel : indoor playground area and baby sitter and pediatrician services available on request. In the room : cots on request. On the beach : live entertainment service with baby / mini / junior club.